Photo by Micah Tapman — CBMT Creative. Seattle Sockeye and Toronto GOAT will be taking the showcase field on Thursday in one of the most recent rematches of any pool play game. The same two teams saw each other in the semifinals of the Pro Flight Finale in a game that Ultiworld just released in full last night. With it being the last regular season tournament of the year and both teams vying for higher and higher seeds at the Club Championships, this was no doubt an important game for both squads. In addition, with it being so late in the season, both teams were striving to hammer out kinks in what will most likely be their big time strategies in Frisco this weekend. For that reason, in preparation for Ultiworld’s live-streaming of that pool play game, here is a breakdown of the semifinal meeting between these two teams. Read on as Ultiworld takes a look at the strategies, techniques, tactics, and skills that lead GOAT to a 15-12 victory and attempts to anticipate how and where we will see those same aspects in Thursday’s game. If you haven’t been following GOAT closely, you may not be aware of this team’s potent firepower on offense. GOAT’s offense either hucked for a score or hucked close to the goal line on 5 of its 7 scores in the first half. With throwers like Derek Alexander and cutters like Adrian Yearwood, GOAT is not even a little bit frightened of putting the disc in the air. GOAT is looking very comfortable in its vertical stack. They chose to go with a split stack only three times off of the pull and, each time, looked to transition back to a vertical stack as quickly as possible. It’s worth noting that on points 6-6 and 8-7 (two of those three points), GOAT’s offense struggles mightily with flow and Sockeye manages to get Toronto out of rhythm. Another note: two of those three split stack starts seem to come in direct response to Sockeye’s prior defensive strategy or personnel changes on Sockeye’s part. At 5-5 Seattle comes down with its big cup and on GOAT’s next offensive possession they come out in a split stack. 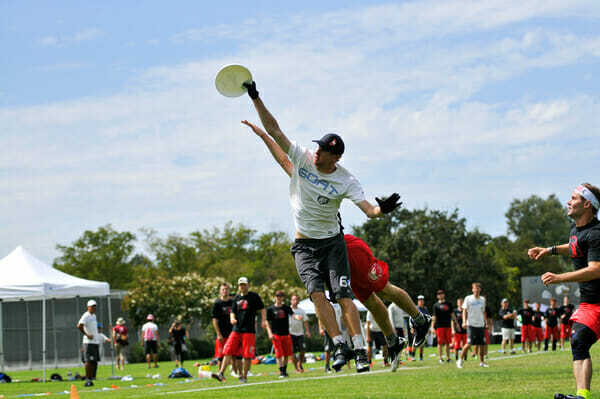 At 14-12, Sockeye has a very tall lineup on the field defensively and GOAT again goes split stack. It seems that if GOAT can anticipate a zone look, they like to send a split stack downfield in hopes of having good spacing right off the pull. It seems that the most important thing for GOAT’s offense coming into Thursday is going to be continue doing what works best for them. Sockeye hardly challenged a single huck for the entire game. It was also interesting to see frustration build up among Sockeye defenders as GOAT’s patience won out over everything that Seattle threw at them. Though the Fish were able to force some riskier looks by taking away the huck, they could not earn a break in the game. GOAT’s defense was the most uninteresting aspect of this game. Toronto tries some junk early on points 0-0 and 2-2 with varied success (Sockeye eats them up on 0-0 but barely comes down with a floaty hammer 2-2 to save possession and hold). Then GOAT tries a poaching, switching, man defense against Sockeye’s vertical stack at 7-6 that stops nothing and after that, it’s more or less all man defense all the time. On the two turnovers that result in GOAT’s two breaks, it’s easy to argue that Sockeye has no one to blame but itself for the turnovers. At 4-4, Sockeye is moving the disc well until GOAT’s defense manages to catch up and force a reset. At that point, Sockeye isolates Nate Castine and he struggles to get open. When he finally does, the disc is placed a little too close to him and he fails to come down with the disc. At 13-11, Mike Caldwell is isolated with the first cut for Seattle and immediately puts up a huck that is short of its target giving GOAT an easy block. While there is plenty to be said for giving your opponent an opportunity to make mistakes, GOAT more or less sits back while Sockeye’s offense spends most of this game in its wheelhouse. If Sockeye cleans up its mistakes, GOAT will need to do something to take Seattle out of its comfort zone in order to force mistakes instead of just allowing them to happen. If you want to know anything about the Sockeye offense you simply need to watch point 9-7 to see what Sockeye wants to do with the disc. Joe Sefton, Nate Castine, and Chris Kosednar spend the entire point bouncing the disc back and forth between each other from the handler position. The point lasts 16 throws and not a single cut that originates downfield ends with its receiver catching the disc. Castine is a key cog in this handler-centric offense. Castine makes important plays throughout the game to keep the Sockeye offense moving. His break mark throws and quickness around the disc are central to the Sockeye offense. In this game, he takes most of what he wants, so it will be important for GOAT to deny him something in order to slow down Seattle’s offense. The Fish seem comfortable in just about any set offensively. When your handlers are the most important aspect of your offense, it gives you some freedom to not feel pressured no matter what is happening downfield. So, Seattle comes out in a number of offensive sets: horizontal, vertical, and side stacks are all seen in one form or another during the game. Though Sockeye is the only team to give up a break during this game, its offense looks more or less just as smooth as GOAT’s in this game. GOAT struggles to take anything away and Sockeye’s quick movement leaves Toronto players just shrugging their shoulders throughout the game. On the one hand, Sockeye should be incredibly encouraged by its defense. Seattle seemed to come into this game with a gameplan and executed that game plan perfectly. It has long been purported that Sockeye and Vancouver’s Furious George were the killers in the murder of the vertical stack that happened in the early-mid 2000s and Seattle did a good job of showing just how that murder went down in this game. The Fish have an incredibly active defense that switches seamlessly off of the pull to stop GOAT’s initial looks. At points 0-1, 1-2, 2-3, 3-4, 10-9, and 12-11, Sockeye manages to effectively shut down GOAT’s initial looks with an alert defensive style. The discouraging aspect of that effective defense is that it only forces one turnover (at 0-1 on a first throw overthrow) and converts zero breaks. That is because GOAT is so effective with its resets and so loose with its hucks. Derek Alexander dominates the first half of this game for GOAT by unleashing some monster hucks that laugh in the face of offensive flow. Seattle again effectively reacts by switching up matchups and putting the long Frank Devin-Barich on Alexander at 10-9. It’s at this point that Sockeye finally manages to begin slowing down the Toronto attack. However, GOAT knows what it needs to do and attacks the breakside with a vengeance. Seattle is able to force only one more turnover after 0-1. That is where the large problem for Sockeye’s defense lies. GOAT’s defense converts on every break opportunity it is given. Meanwhile, Sockeye gets two turnovers and converts neither of them. At 0-1 Seattle gets stalled on the goal line and at 7-7 the Fish throw up a very poor huck to a crowd that no one comes down with. With GOAT’s offense as patient and efficient as it is, Seattle will need far more efficiency from its own defense if it hopes to win on Thursday. Watch the game LIVE on Ultiworld by purchasing a Club Championships video package, starting at just $12. Comments on "Feature Game Preview: Seattle Sockeye v. Toronto GOAT"